A Debian Jessie server: You may want to see this guide in creating your first Debian Jessie droplet in DigitalOcean. A non-root user with sudo privileges: You can set this up by following the Debian 8 initial server setup guide. We'll install Apache to use it as a reverse-proxy for our blog. To run Ghost, we'll need install Node.js, the foundation for our Ghost platform. First, you will need to pick a path in your file-system where you want to install Ghost. Note: Do not forget to replce /var/www/ to your desired path. Now that Ghost has been installed, we'll need to configure it. Note: Please be patient. Installing may take up to 5 minutes. Note: Change the "url" directive to your domain or public IP in the "production" code block. Don't include the trailing-slash. 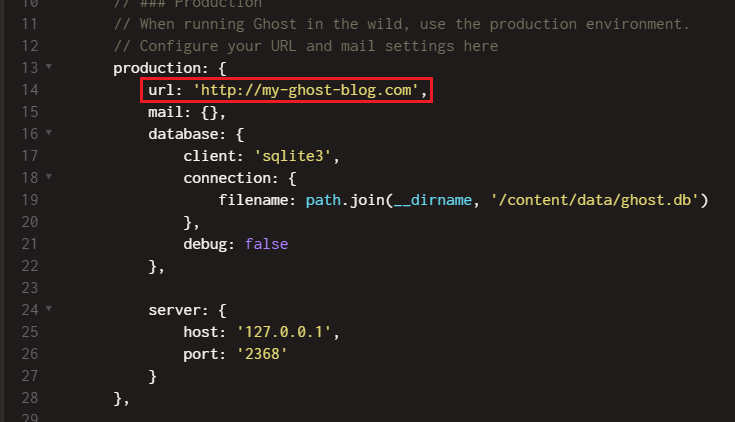 Tip: You may also want to check this doc to configure email settings for your Ghost blog. If you're done editing the config.js, press crtl+x and y to save your changes. This set-up should be fine, unless you plan to close your terminal window or end your SSH session. In which case your blog will shut down along with it. To solve this problem, we'll run Ghost with forever. To stop Ghost blog, press ctrl+c. Note: Don't forget to change "/var/www/" to your chosen path. To configure Apache as a reverse-proxy for Ghost, refer to the code block below. Info: We don't need to explicitly declare a "DocumentRoot" because we're going to forward all traffics to the Node.js server anyway. Note: Don't forget to change the ServerName directive to your own domain or public IP. 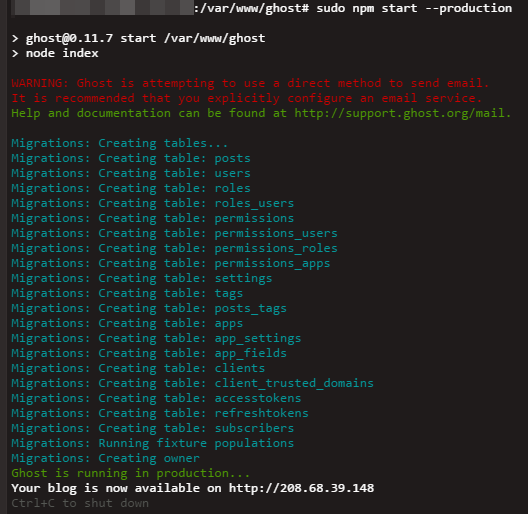 In this guide, we have shown you how to install and configure Ghost as a blogging platform, how to run it with forever and how to reverse-proxy it with Apache for production use.